I have to admit, one of my pet peeves is looking at all the glossy and styled kitchen photos in magazines and not seeing how people really live in them. I'll often look at pictures and wonder, "Where do they keep their dish soap and hand soap? Where's the sponge?" Admittedly, not glamourous stuff, but oh so essential. Why else would we be at the sink? When we were designing our kitchen, I had a few must haves for the sink. I knew I wanted one single basin sink, preferably a farmhouse sink and a tall gooseneck faucet. A single basin sink suits our needs much better. With our old double basin sink, I could never properly soak a pan with a long handle. Also, the gooseneck faucet is key to washing and filling big pots. I'm loving these 2 recent additions that I want to share with you. First, I love foam soap pumps. They are so practical! The foam definitely makes it easier for small hands to spread the soap, and we use 90% less soap! It's amazing! We were reusing our Bath and Bodyworks pump for awhile, practical, but I wanted something more attractive. I was happy to find this foam soap dispenser at Crate and Barrel for $14.95 . I love it's sleek, clean shape and it works great. 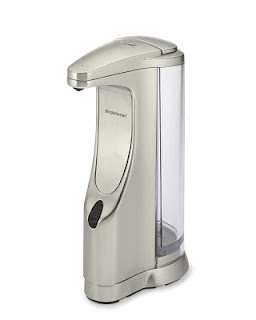 Second thing that I love is our Simple Human Automatic Soap Dispenser. A friend of mind turned me on to these and I love mine! 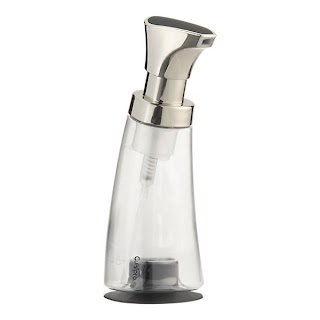 No more dripping around the soap dispenser and getting the edge of the sink all wet. Getting these at Bed, Bath and Beyond with a coupon is the best way to go. Oh, and one more thing... Simple Human has GREAT customer service. We had one that stopped working, they paid for shipping for us to mail it back and mailed us a new one! There you go! I hope I haven't bored you to tears, but it's things like these that truly mean, "elevating the everyday". Have a great day! Next week, I'll be talking about how to style your toilet. :) Just kidding! your sink is just beautiful! i'd love a farmhouse sink. no, LOVE. gorgeous! !